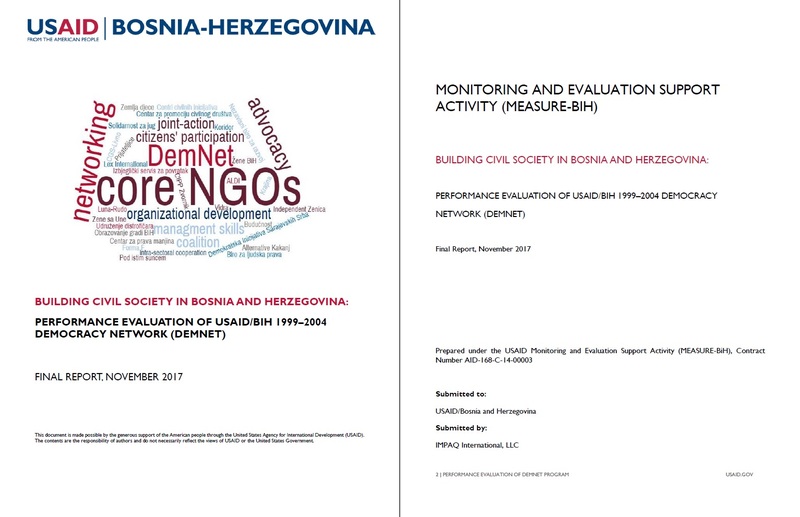 Democracy Network (DemNet) program was a five-year intervention funded by the USAID/BiH with aim to strengthen local civil society organizations by improving their organizational and service-providing capacities between 1999 and 2014. The intervention was delivered in two phases (DemNet I: 1999 – 2001; DemNet II: 2001 – 2004). It included training and technical assistance (delivery of customized support packages to NGOs), grants (to reinforce the former), exit strategy (development of resource centers for NGOs), and coalition-building. How sustainable in the long run have NGOs from the core group of DemNet beneficiaries been, what are their organizational and financial capacities now, and to what extent have they used DemNet experience and assistance in building their capacity? How successful in the long run were NGOs from the core group of DemNet beneficiaries in serving as leaders within BiH civil society and providing valuable services to citizens, representing citizens’ interests, and providing technical expertise to policy makers in order to ensure that they and the citizens can participate effectively in economic and political life, and to what extent has DemNet experience and assistance contributed to this? How successful have NGO coalitions formed through DemNet been in the long run in public advocacy? To what extent has DemNet experience and assistance contributed to this? The evaluation team employed a mixed-methods approach to answer each of the evaluation questions through triangulation. In addition to reviewing DemNet design and implementation documents, the team conducted 60 semi-structured interviews, held a round-table discussion with core DemNet beneficiaries, conducted an online survey of 56 DemNet beneficiary and non-beneficiary NGOs, conducted a case study of three beneficiaries, and conducted media content analysis (706 articles analyzed).